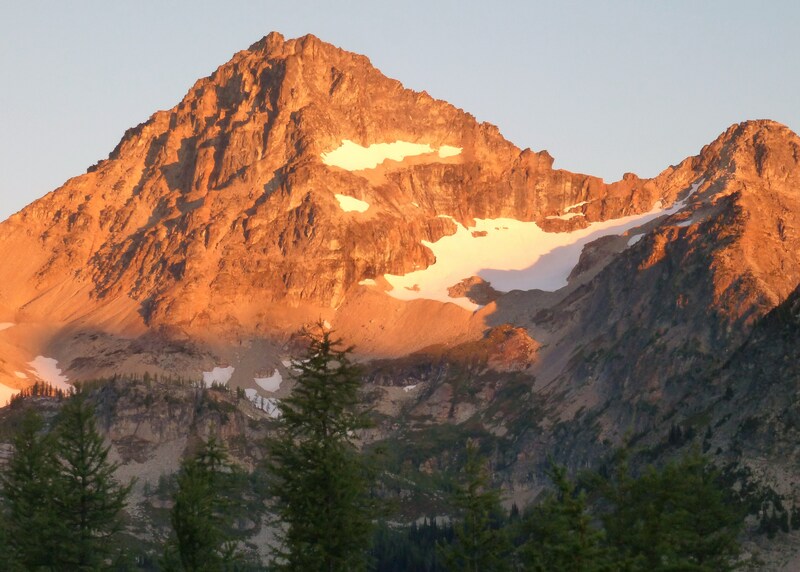 Although it is not possible to call any one hike our favorite because they all seem to be so wonderful, from the moment the early morning sun glowed on the mountain peaks surrounding our camp, this may have been our most beautiful day on the trail – ever. After spending two nights camping just below Heather Pass, we had a most enjoyable morning at camp before it was time to pack up and finish the loop along the Heather-Maple Pass Loop Trail. Sharing the trail with members of the Skagit Audubon Society Hiking Group, we had several opportunities to chat with some of them along the way. There was a large number of their group on the trail that day, but because they had divided themselves into small groups of two to four hikers, they did not make the trail feel over crowded even when we meet them along some of the most narrow or steep sections of the trail. 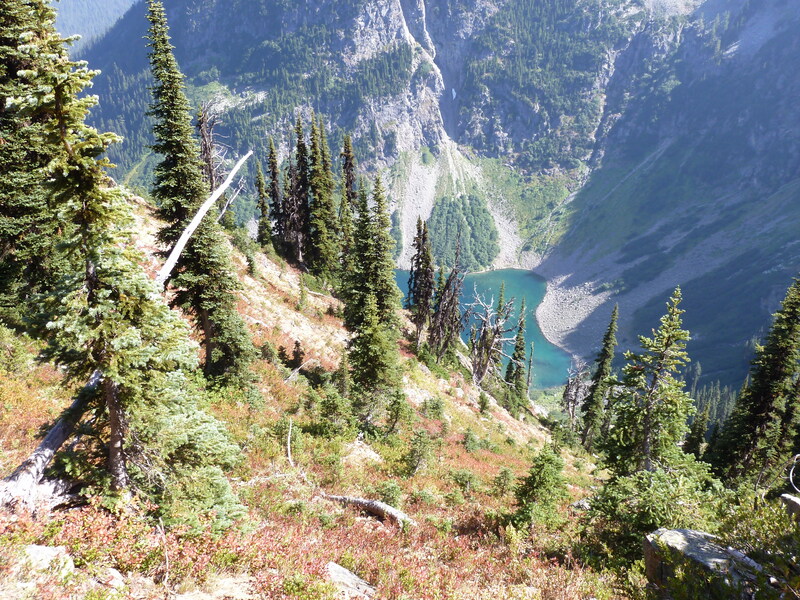 Once we had hiked from Heather Pass to Maple Pass, the trail followed high ridges for several miles – up and down each ridge with stunning views of distant mountains. Here’s Kent, high above a tiny-looking Wing Lake next to a large snow field. The blueberries were just beginning to ripen along the trail. How could we resist snacking on a few as we passed by? This is one of my favorite photos from the hike! Taken at about the highest point of elevation along the trail, it felt like we could see for ever! We had started this backpacking trip from the parking area for the Rainy Lake Trail near Rainy Pass, and with our heavy packs on our backs, it felt pretty good when Rainy Lake came into view from along the trail. 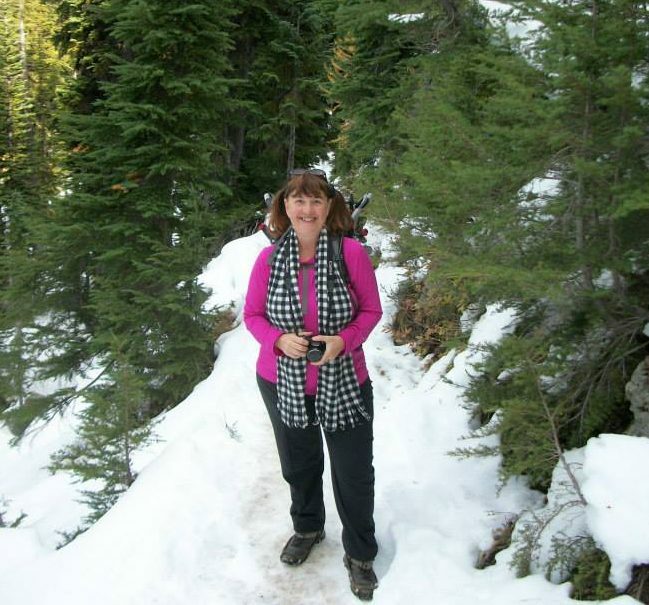 It was a steep trail down hill from this point – but at least it was downhill, rather than up! The trail soon led us back into the forest, and became a series of very steep switchbacks down as we continued back to the trailhead. Information about hiking the Heather-Maple Pass Loop hike can be found on the Washington Trails Association website, here – http://www.wta.org/go-hiking/hikes/maple-pass. and you can read about Day 1 and Day 2 of this backpacking trip here – Hike #77 – Lewis Lake, Heather Pass and Lake Ann Overlook – and here – Hike #76 – Heather Pass – Setting Up Camp.